Would you like to spend less money for Lexmark toner? If your laser printer is low on laser toner you'll be able to receive great savings by simply ordering any replacement Lexmark C546-dtn toner online store. Thanks to our competitive prices and low price promise, you can rest confident of enjoying the cheapest deal for Lexmark C546 dtn toner cartridges. Furthermore, Cartridge Save supply Lexmark C546dtn toner cartridges which are high quality and additionally low in cost so you can get peace of mind with every single order. If perhaps you've purchased Lexmark toners with us before you'll know that our fast and free delivery service is a major advantage. This specific low cost Lexmark C546dtn toner cartridge may be bought online at our checkout page so don't lose out and purchase now for the chance to make significant savings. Meanwhile, you can buy a great value Lexmark C546-dtn toner cartridge by simply phoning our order number. Keep in mind, Lexmark C546 dtn laser printer cartridges dispatched by us will also be guarded with a guarantee which will give you the chance to obtain a complete refund in case you are unhappy with a malfunctioning cartridge. We're offering next day delivery, solidly built laser toners as well as the lowest prices. It will make good sense to stay with Cartridge Save for your C546-dtn toner cartridges. The compact, versatile, and network-ready Lexmark C546dtn is a budget friendly choice for small- to medium-sized work environments. This extra economical printer uses high-yield cartridges, has an instant warm-up fuser, and an eco mode. The Lexmark C546dtn is a compact colour laser printer with 256MB RAM and is designed with efficiency in mind. It can print up to 25 ppm, and is surprisingly compact at 24.6 x 20.1 x 24 inches (56 pounds). There is an optional 550-sheet drawer for additional paper handling. 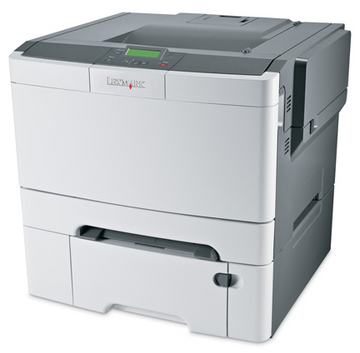 The Lexmark C546dtn can also be integrated in a network, support direct USB connection, and handle duplex or double-sided print jobs. The interface is user-friendly and intuitive, and the controls and buttons are uncomplicated. Some of the major highlights of Lexmark C546dtn include the extra paper tray, the built-in duplexer, and fast print processing. More importantly, it produces good-quality prints and drives down energy consumption and ownership costs. The printer warms up fast; s Ethernet and USB 2.0 connectivity are standard. For a printer in this level, the Lexmark C546dtn is a bit outdated. It could use a hard disk, wireless connectivity, a faster memory, and a faster processor. Switching between single-sided printing and duplex printing takes too much time. The C546dtn is marketed as a 'multifunction' machine but it lacks a scanner/ADF. The LCD screen is also small and limited because it cannot display graphics. While setting up Lexmark C546dtn is simple, it is time-consuming. The print speed needs to be improved as well, because at 25ppm, it is slower than most competing laser printers.